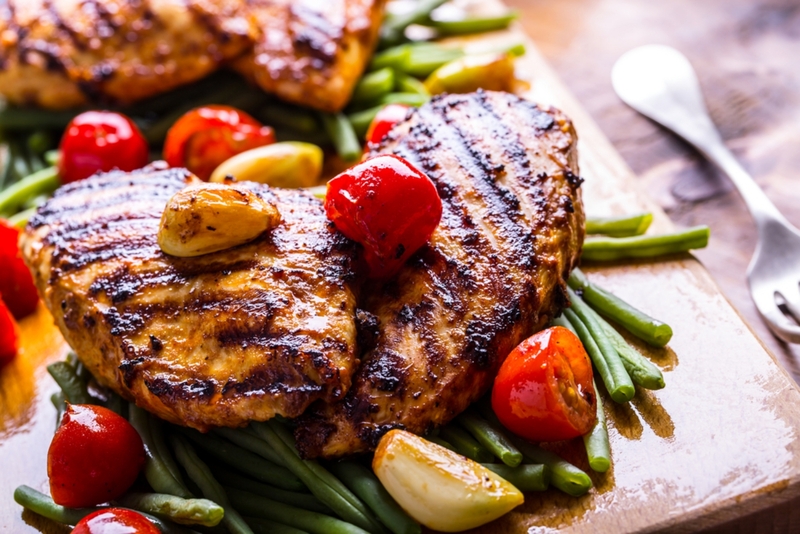 This grilled chicken has a cajun kick but isn’t too spicy for the youngsters to enjoy! It’s a super quick (and healthy!) dinner to throw together for the family on a rushed weeknight, plus you can prepare the spice rub as far in advance as you want – we like to make one extra large batch at a time, that way we always have plenty on hand! If you know you’ll be short on time, you can toss the chicken in with the rub a day ahead of time, and throw it in the fridge overnight. That way, all you’ll have to do the next day for the chicken is fire up the grill! A home cooked meal doesn’t get much easier than that – and these chicken breasts turn out moist and juicy every time! Preheat grill to highest heat and close lid while preparing spice rub. If using the oven, preheat to 350º F and lightly grease a baking sheet. For the spice rub, combine cumin, oregano, smoked paprika, chili powder, thyme, ground mustard and salt in a large ziplock bag, shaking gently to combine. Pour in melted butter, then seal bag, and mix butter and spices together. Add chicken breasts to bag, shaking bag to make sure chicken is coated well with spice mixture. Remove cover from grill and turn heat to lowest setting. Place chicken breasts on grill and cook for 5-7 minutes on each side. Remove cover from grill and turn heat to lowest setting. Place chicken breasts on grill and cook for 5-7 minutes on each side. If using oven, Heat a heavy skillet on high heat for about 5 minutes, until smoking hot. Carefully place chicken breasts into the pan, and cook about 1 minute on each side. Transfer to baking sheet and bake for 5-7 minutes, or until cooked through. When chicken is done cooking, transfer to a serving platter and cover with foil. In a medium pan, sauté cherry tomatoes and garlic cloves in olive oil, on high heat. When slightly caramelized, 3-4 minutes, remove foil from chicken breasts and spoon over the top. Serve with green beans (optional) and enjoy!